Derry City's Ben Doherty is looking forward to Friday night's crunch clash with Shamrock Rovers in Tallaght. 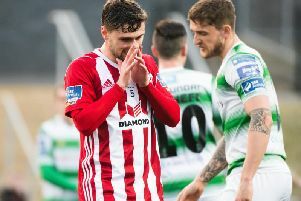 BEN DOHERTY insists Derry City players are treating Friday night’s crunch clash with Shamrock Rovers as their ‘cup final’ as they bid to go EIGHT points clear of their rivals for a third place finish. The ‘Candy Stripes’ have put themselves into the driving seat for European qualification following three consecutive league wins. Sunday evening’s 3-0 victory over Limerick saw City move five points ahead of Rovers and so a win in Tallaght on Friday night would certainly place daylight between the teams. But Derry must plan without two of their most senior players in Aaron Barry and Nicky Low who are both suspended for the match, with Rory Holden and Eoin Toal expected to deputise. “We just have to push on for Friday night and Shamrock Rovers where we need to get the three points and nothing less,” he claimed. Tallaght will be our cup final against Rovers. It’s a game we need to win and it should cement our place in third. “A draw would probably be a good result, but we want to keep away from the mix as much as we can because last year we were caught up in a dogfight. It was the perfect weekend for Derry with Rovers losing in the Dublin derby to Bohemians and Bray Wanderers falling to their fourth defeat on the spin when hosting Finn Harps. “Today’s match was a double header for us,” Ben continued. “With results going our way this weekend we just wanted to get a win and put us completely into third position. Hopefully we can kick on this Friday night. And while Shiels has urged his side to produce yet another quality performance in the south Dublin venue having won 1-0 thanks to the late Ryan McBride’s winner on March 10th, he’s taking a cautious approach. Friday’s match is the first of three huge games for Derry with a double header to follow against Dundalk in the FAI Cup first round and in the league. But Shiels isn’t looking past Rovers who will be anxious to close the gap. “They could beat us and win their game in hand and then they’re ahead of us in a matter of days but that’s football. We’ve stretched away from Bray we’re seven ahead of them and that’s a fantastic turnaround but we have Rovers and Dundalk in our next three games. “We can’t look beyond the next one and it’s a tough game. We’ve got to go there and play with the same panache and techinque and all of those things have to be considered as high on our list is to entertain. “So let’s hope we go there and get something from the game,” concluded the Magherafelt man.